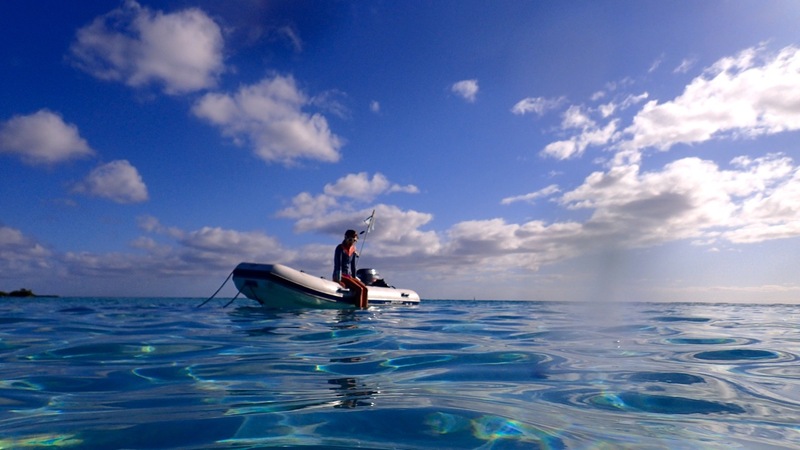 Foregoing the bleak weather in Haapiti’s anchorage, we moved around to the north side of Moorea yesterday and dropped hook in the crowded, yet beautiful, Opunohu Bay. We actually didn’t venture deep into the near 2 mile long bay, we joined the crowd in the turquoise waters just inside the reef. As Gregory puts it, Moorea is a lot more “touristy” than other islands we’ve been at. Hotels bearing recognizable brands like the Hilton have rows of private, thatched-roof bungalows extending out over the water. With our own private home floating over the same postcard-worthy waters we took advantage of the “sights” no doubt built up for the hotel goers. 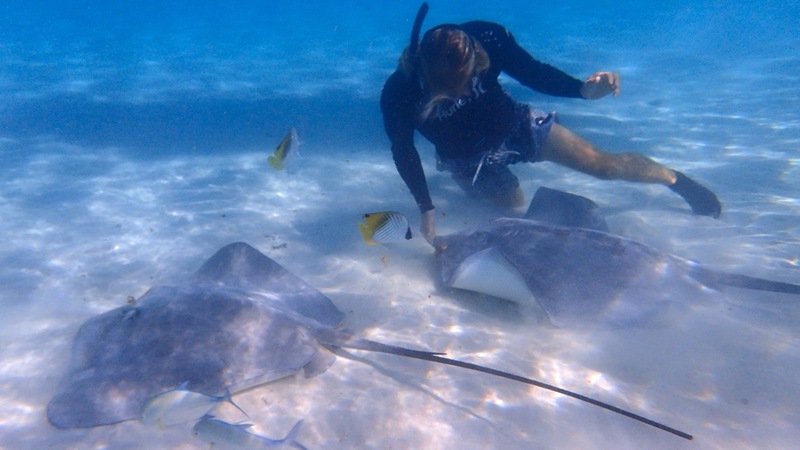 This morning we ventured out early to Stingray City to beat the crowds. 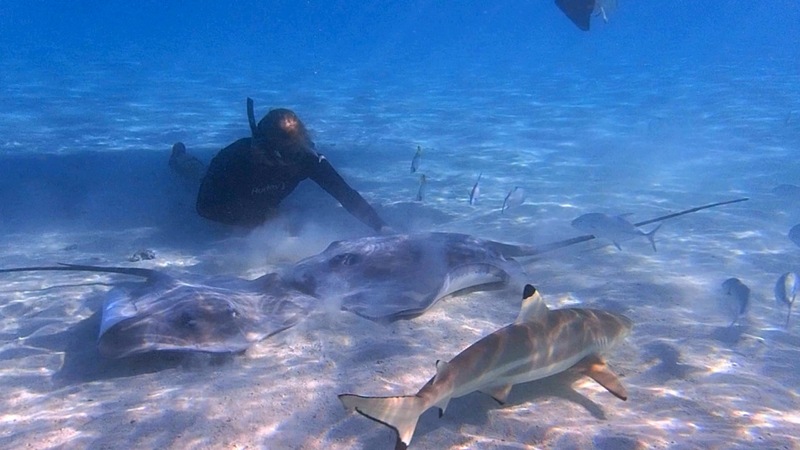 At one particular sand bank inside Moorea’s lagoon, buoys mark an area were some exceptionally friendly stingrays hang out (clearly encouraged by the daily feedings the tourist boats offer them). 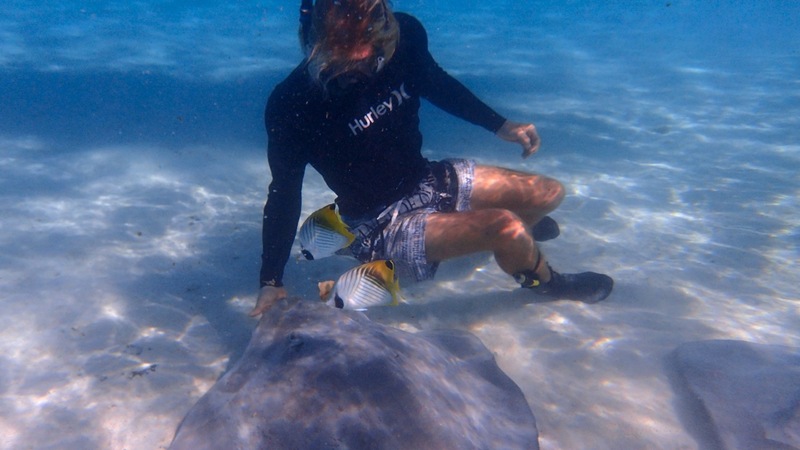 Greg was barely in the water before two pushy rays were on top of him looking for a bit of breakfast. 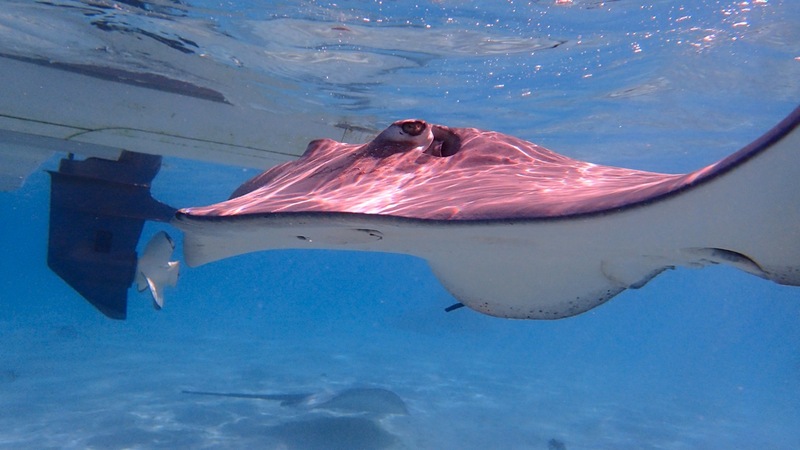 With the rays come their complete entourage which includes colourful reef fish, speedy jackfish, and a gang of decidedly overweight blacktip reef sharks. The motley group of us hung out for ages circling and spinning and checking each other out. 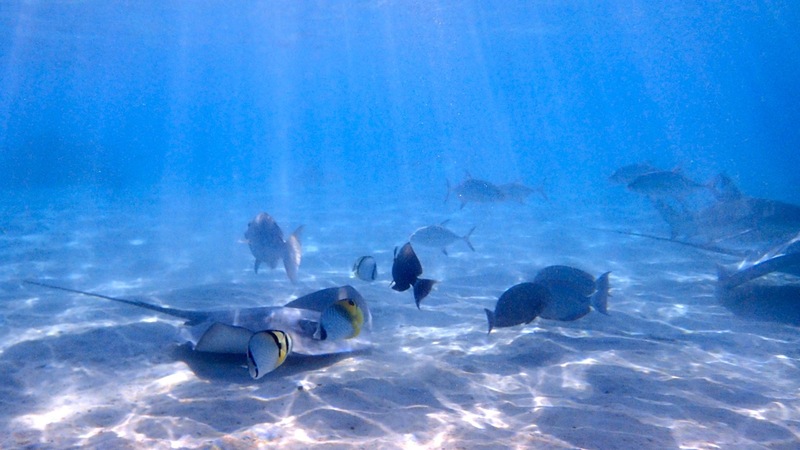 It was an early morning well spent in Moorea’s vibrant and teeming waters. Back at the anchorage, Josh’s newest mate aboard Kuhela, was organizing a free diving course for the afternoon. 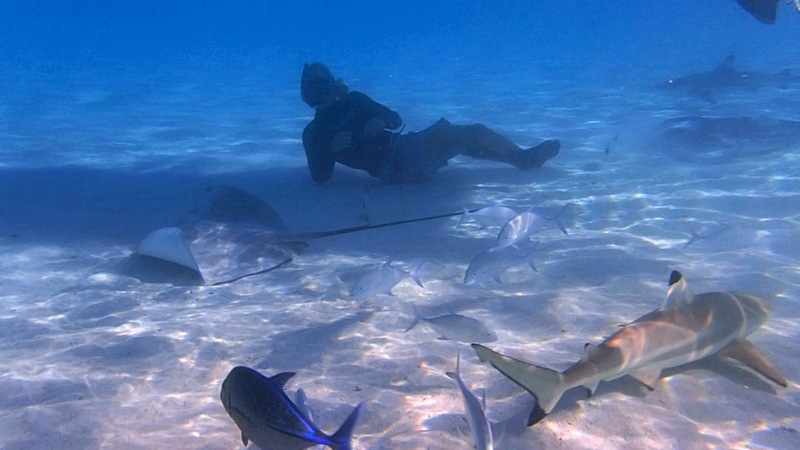 Joe, from Western Australia, is a certified free dive instructor who teaches classes back in his home waters. 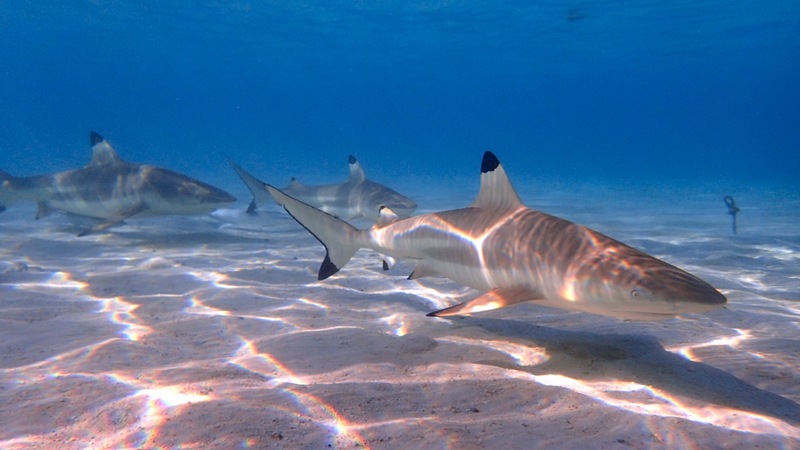 As free diving is more of a life passion than a meal ticket for Joe, he was happily offering those interested cruisers, an afternoon rundown of the basics. Given the topic, Gregory was obviously one of the first to sign up. But before the school bell rang this afternoon we had one more important task to attend to. At the head of Opunohu Bay there is a shrimp farm which on Wednesday, and only Wednesday, is open to the public for purchase of their delectable harvest. With Marie as our chariot, we motored on down to the beach head and crossed the road to the extremely accessible shrimp farm. We walked right up to a small garage like building where three people were working to sort, weigh, and package the big tasty shrimp. We joined the growing queue and within minutes had a 1 kg bag of the freshest shrimp available. With the shrimp on ice we were back in time for Gregory to head to school. I always knew there was a lot more to free diving than simply holding your breath and hoping for the best, though Gregory’s summary of his day’s learnings helped me to gain a new level of respect for the sport. Their course started with a couple of hours of theory. They covered the basic anatomy of the body’s breathing apparatus and reviewed the science behind the body’s ability to convert oxygen to carbon dioxide. From there they delved into the different signs that alert the body of oxygen depletion in the blood stream. For free diving goes well past that initial I-need-air moment that us mere mortals experience 15 seconds in. When they moved to the practical part of the lesson, Gregory held his breath for four minutes while practicing static training in the water. In those four minutes Gregory felt one contraction in his diaphragm. The rule of thumb is that you have four diaphragm contractions until your oxygen levels are so low that your muscles begin to burn. Here you are in real danger of passing out and it is critical that you get to the surface. So they learnt it’s very important to listen to your body and be aware of your surroundings and capabilities, once you note your second contraction passing. All in all we had a stellar day full of fun excursions, succulent treats, and enlightening knowledge. 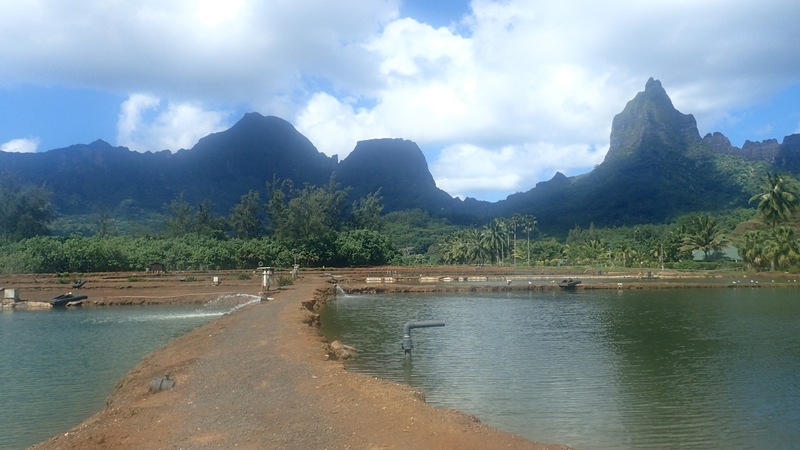 So far, Moorea is turning out to be a prosperous stop on the Oceanna adventure. They could barely wait for someone to get in the water! 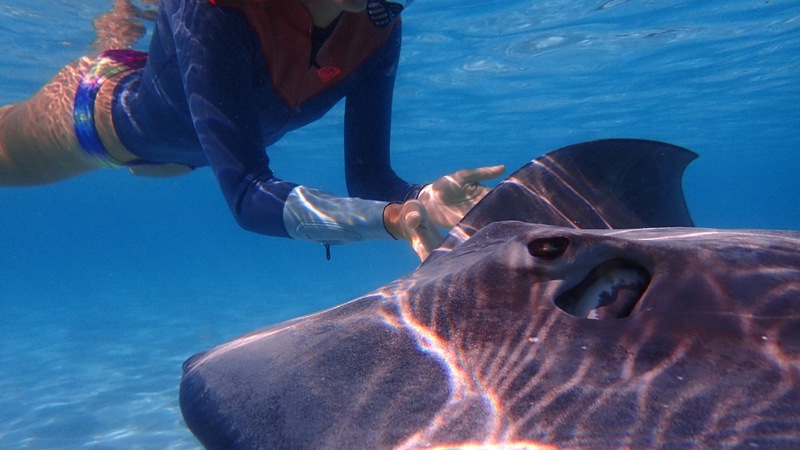 These are very, very friendly stingrays. We’ve taken to calling those black, white, and yellow reef fish RetroFish. They remind us of old school ski wear. Maybe even something my Mom used to sport. 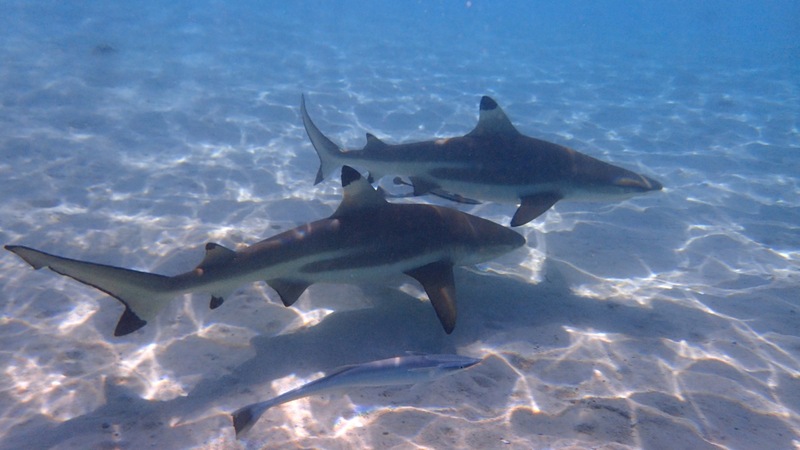 Blacktip reef sharks, and their clingy friends. A single frame does no justice to all the life that was bustling in this area. Getting up close and personal. It looks like they’re having a deep conversation. 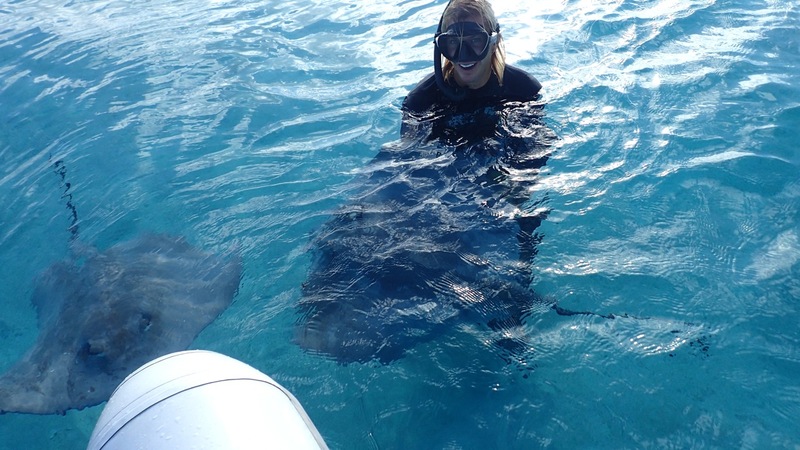 Rays and reef fish and long-nosed emperor and jacks and sharks and us! It was a beautiful morning. I think Gregory could have spent all day down there. We were on good terms. Ya there’s more pictures, couldn’t help myself.